Our 100 x 280 Premier Party Tent is the tent for the person who won't accept anything other than the very best. 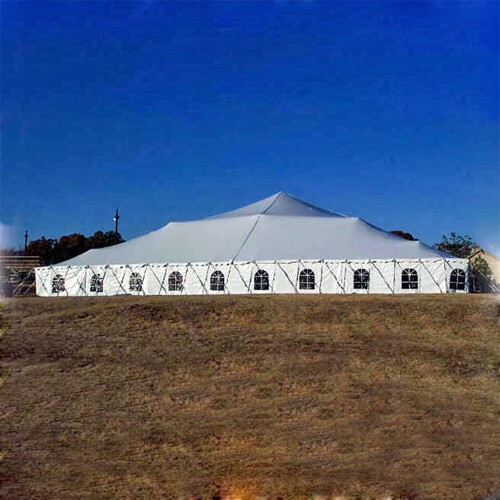 These durable tents are made with the highest-quality materials, the best construction, the most skilled craftsmanship, and the best mix of style and function in the industry. Event hosting, temporary storage, outdoor revivals, and even the tent rental business - these amazing canopies can handle it all. The heavy-duty canopy top comes in a convenient bag and is made of 15-oz. 'Block Out' laminated vinyl. That offers unparalleled protection from rain, wind, sun, and any other condition that can ruin a day outdoors. All of the poles are made of heavy-gauge steel, featuring support poles that are plate-welded and have a rugged pin welded to the top, in addition to galvanized outer poles. The two-inch seatbelt webbing around the perimeter both adds strength and really secures the canopy top to the formidable tent frame. There are even a few extra features you won't find anywhere else. The included installation video really gives the owner a leg up on getting a large structure up without breaking his or her back in the process. The included ratchet system is rated up to 12,000 pounds, giving you plenty of muscle to secure the 'guy' lines which come already attached to the tent top. And in the unlikely event that something does happen to the canopy top, there's a patch kit included to take care of it. The real story on these tents is this: they are designed to survive all sorts of weather, even the rigorous treatment of a tent rental business is no match for them, and they are laid out to accommodate changing needs so that if you need more room in the future, you can simply add a new section. If you own a business, are planning a wedding or event, or just need some extra space there is no substitute for the 100 x 280 Premier Party Canopy Tent. These are the best tents on the market and can handle any application. Flame Certification: This item is NFPA-701 Flame Certified. * Side Poles: 16-gauge steel - 1.660" Dia. These tents are designed to withstand 70 MPH gust in certain conditions. Use the following information as general guidelines only. Good judgment must be used in all conditions. * If tent is properly installed and in tight condition with stakes being in asphalt or concrete, Tent can withstand brief gust of wind up to 75MPH. * If tent is properly installed and in tight condition with stakes being in damp dirt, tent can withstand brief gust of wind up to 40MPH. * Tent must be kept tight in order to reduce movement in windy conditions. * Additional methods are not necessary to support the tent providing that all of the required equipment is properly installed. * All tents should be vacated by all occupants during any weather or wind which is determined to be severe. * A tent should never be considered a refuge from severe weather.